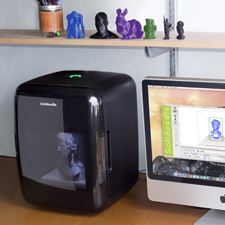 The Solidoodle Press is a one-touch 3D printer created for every day home use. 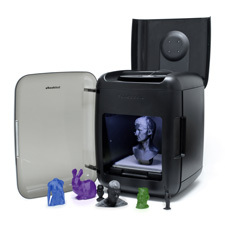 It features a build volume of 512 cubic inches (8 x 8 x 8 inches), a heated build platform with glass bed, resolution up to 0.1mm, and SoliTouch auto-calibration technology. Manufactured and sold by Solidoodle. Grand Idea Studio contributed to the design of the LED ring and button interface.